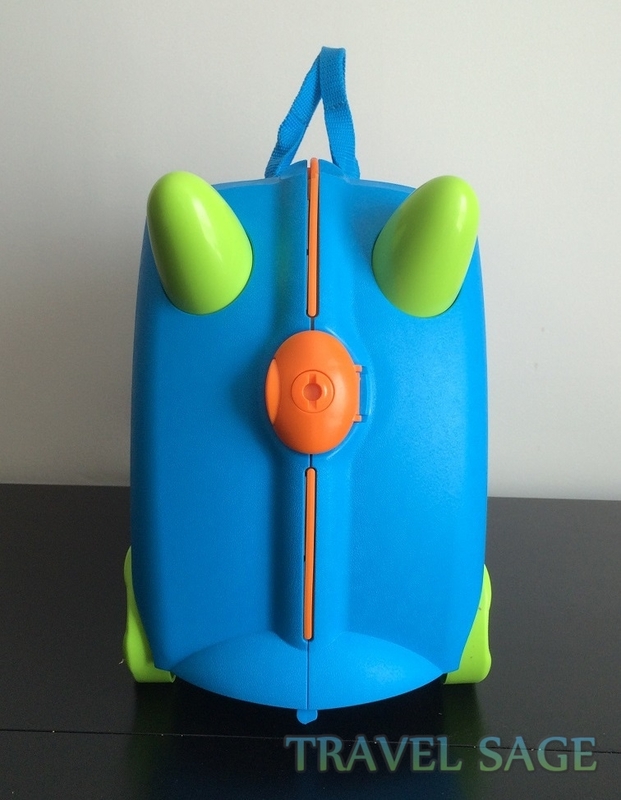 Trunki Ride-On Kids Suitcase Review – Best Childrens Luggage? The best suitcase for kids? 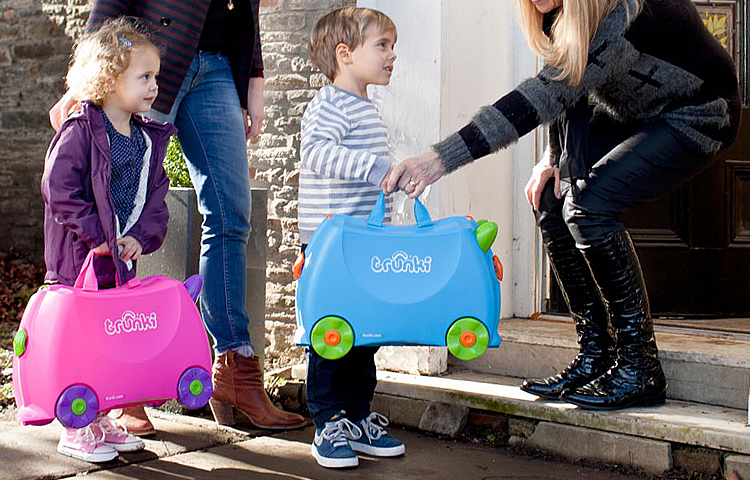 Trunki Ride-On suitcases for kids has grown in popularity since its appearance on Dragons Den in 2006. 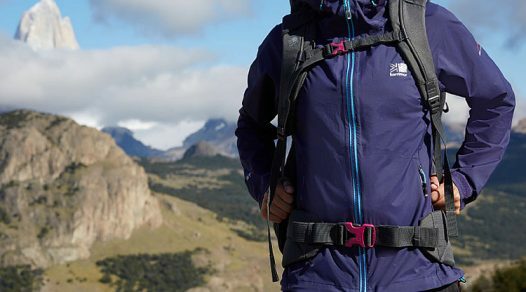 The TV show had rejected the idea from founder Rob Law but now the company has a turnover of more than £1m a year. 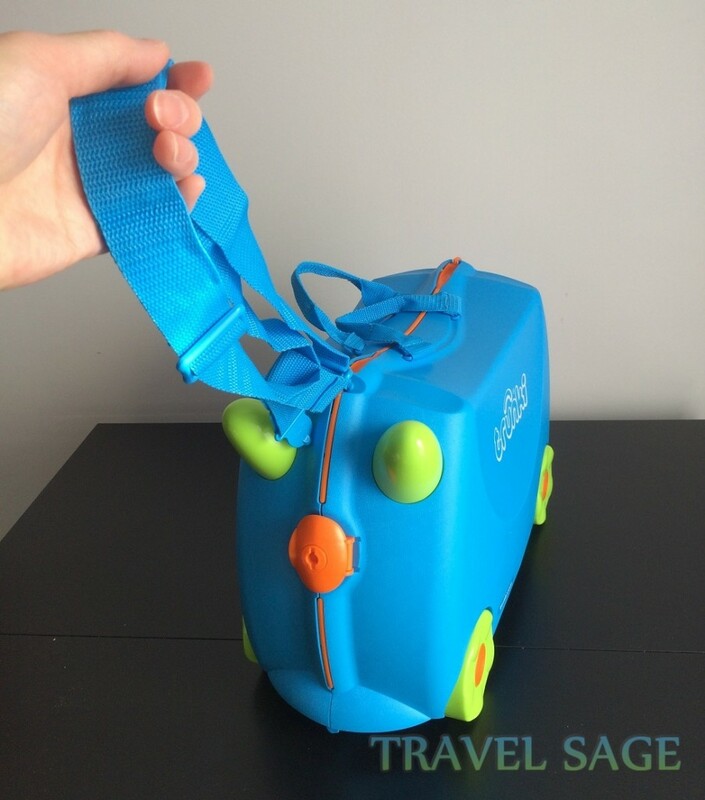 The purpose of the Trunki suitcase is to provide children with a portable toy that they can ride as well as being used as children’s luggage. As they are hard plastic shells, it should be able to withstand anything kids throw at it. My review will look into how useful and durable this piece of children’s suitcase is. 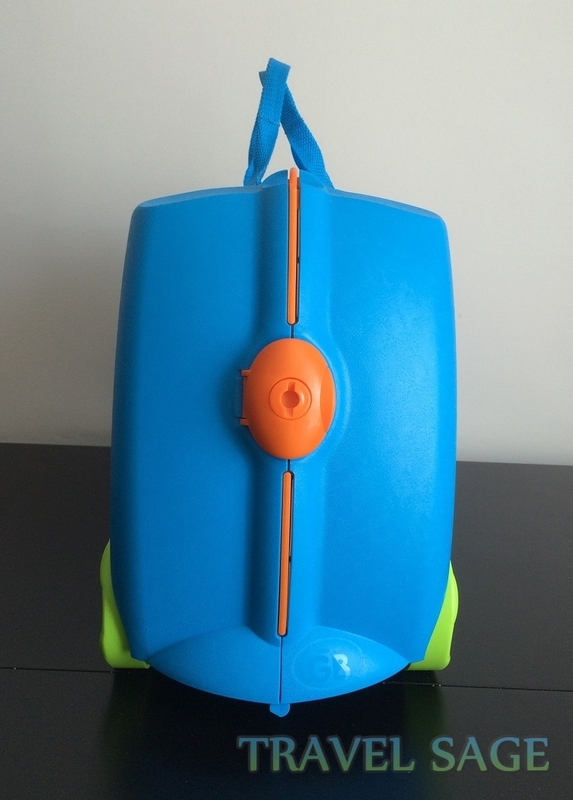 Saddle Seat: Moulded saddle seat in the centre allows your child to sit on and ride the suitcase. 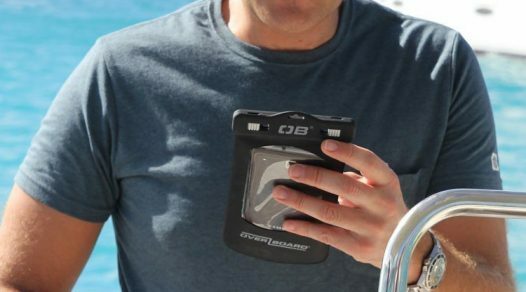 Durable Hard Shell Case: Made with tough and hard plastic which holds up to 50kg. 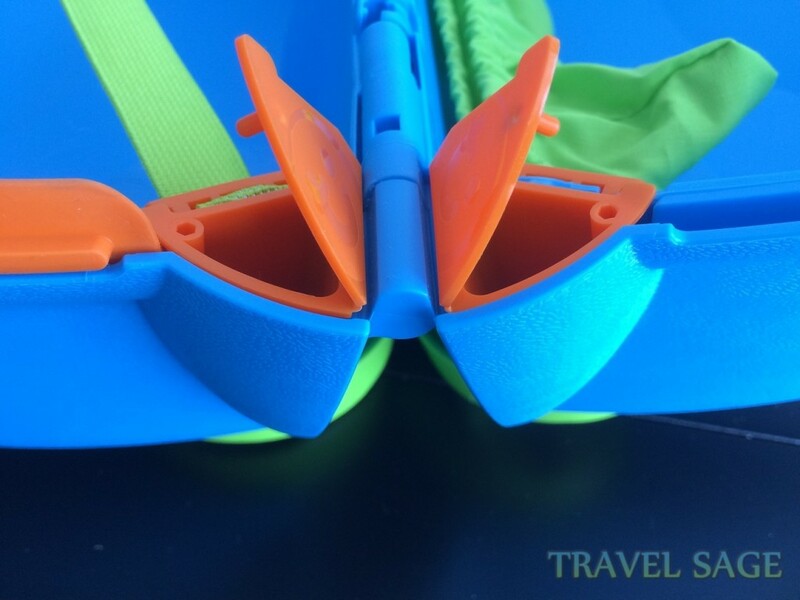 Removable and Adjustable Luggage Strap: The length can be adjusted for you or your child to tow the suitcase. Easy to Clean: The suitcase can be wiped down or washed. 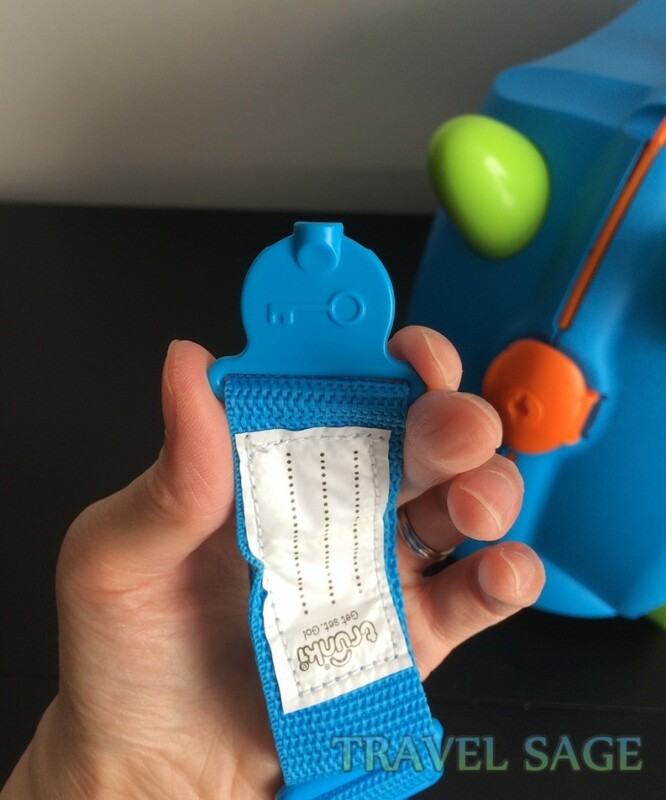 Lockable: The catches can be locked with the special Trunki key which is secured on the luggage strap so it cannot be lost. No Multidirectional Wheels: It’s harder to wheel round corners. 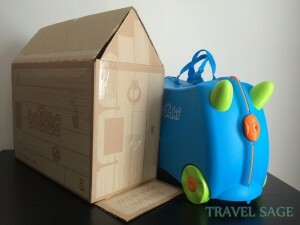 Upon purchase of the Trunki Ride-On suitcase, it came in a decorative cardboard box with a design that looked like a shed. It turns out the box actually turns into a kennel for the suitcase. It takes less than 10 minutes to make up the kennel with the simple instructions on the flap so it’s a nice small activity for the kids to do. Out of the box comes Terence Trunk in his vibrant blue, green and orange colours which is eye catching and attractive to kids. My 3 year old nephew clapped in glee upon seeing Terence. There are many different characters to the Trunki suitcases for boys and girls including a Ladybird Trunki, Trunkisaurus Rex and a pink trunki known as Trixie for girls. There’s even Gruffalo Trunki which is based on the popular ‘The Gruffalo’ children’s book. On one end of the Trunki case is the ‘face’ of the character. This is where two plastic horns are attached at a diagonal angle facing outwards so kids are able to hold onto this for stability when riding. 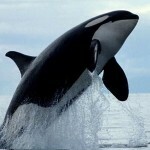 The lockable catch acts as the nose and on the other end is another lockable catch which acts as the tail. The legs of the character are the 4 wheels which are fitted on both sides of the suitcase. Each measures 3.5 inches in diameter and is an inch thick. They’re held in place with a circular tube. Because of the loosely fitted wheels, they’re able to spin smoothly and easily. Despite the loose fit, the wheels are very secure. It’s been wheeled around pavements, the airport and the train station and all its suffered is just some minor scratches from wear and tear. There’s an orange rubber trim in the middle of the suitcase. This protects your child’s fingers when they shut the suitcase. This doesn’t mean they won’t get their fingers trapped but it will hurt a lot less! 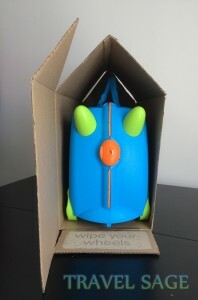 In the centre of the Trunki Ride-On suitcase at the top is where you will see an inward curve. This is the saddle seat for your child to sit on. They can then move around themselves by using their legs to push the suitcase along. Most children should be able to touch the ground with their feet when they sit on their Trunki suitcase, allowing better stability. The manufacturer recommends their suitcases to be for children aged 3 years old but it could be used for younger kids too. My younger nephew aged 2 years old was sat on it and towed along. 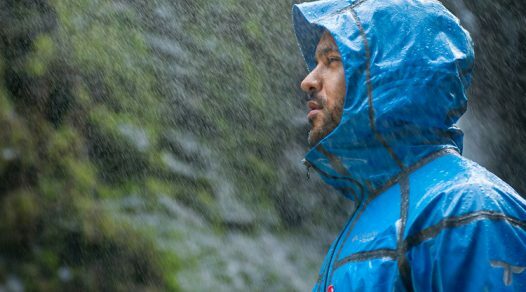 Trunkies are made with a hard plastic shell which feels quite sturdy and tough. Despite the plastic material, the suitcase only weighs 1.7kg. 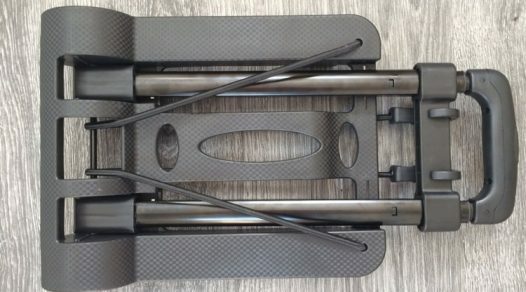 On their website, it says the suitcases can hold up to 50kg in weight. I weigh about 52kg and the suitcase didn’t break or dent when I sat on it which shows the plastic material used is tough and durable. There are two hand carry handles where the saddle seat is. 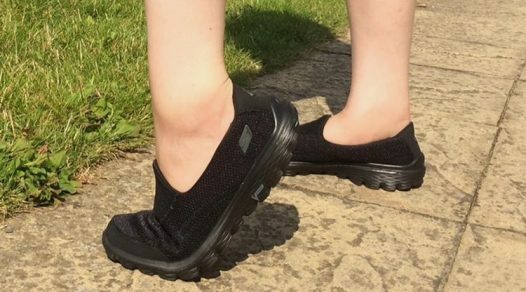 It’s made from a nylon weave material and folded over so it’s narrow and thick in the middle. 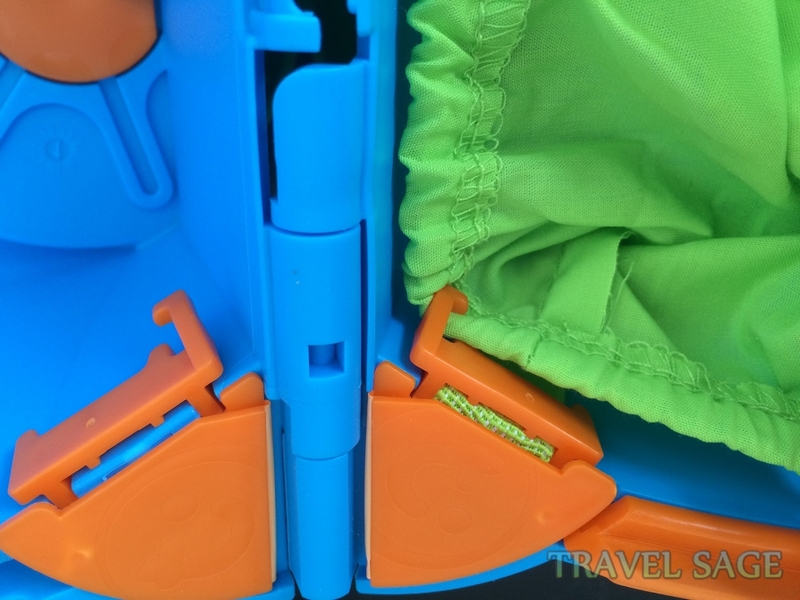 An adjustable luggage strap with plastic clips is included which easily clips onto the two plastic loops on each end on the top of the suitcase. 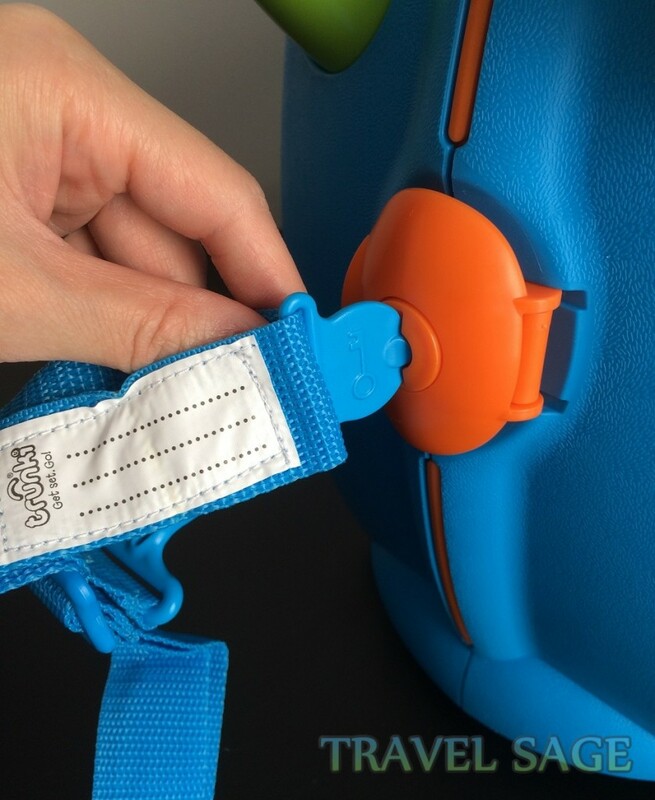 The key to the lockable catches and an ID tag are also attached to the luggage strap. Being plastic, the clips are easy enough to push but it does seem pretty flimsy. Some people have had problems with the clips because it has bent inwards. By clipping both clips to one of end of the suitcase, it can be towed along by yourself or your child. 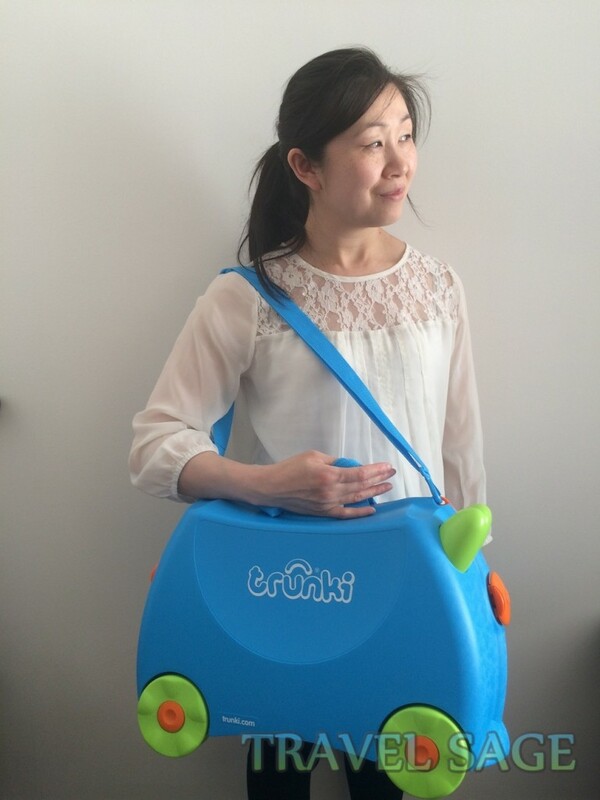 You could use it to carry the Trunki case on your shoulder when your child gets bored of sitting on it or towing it. 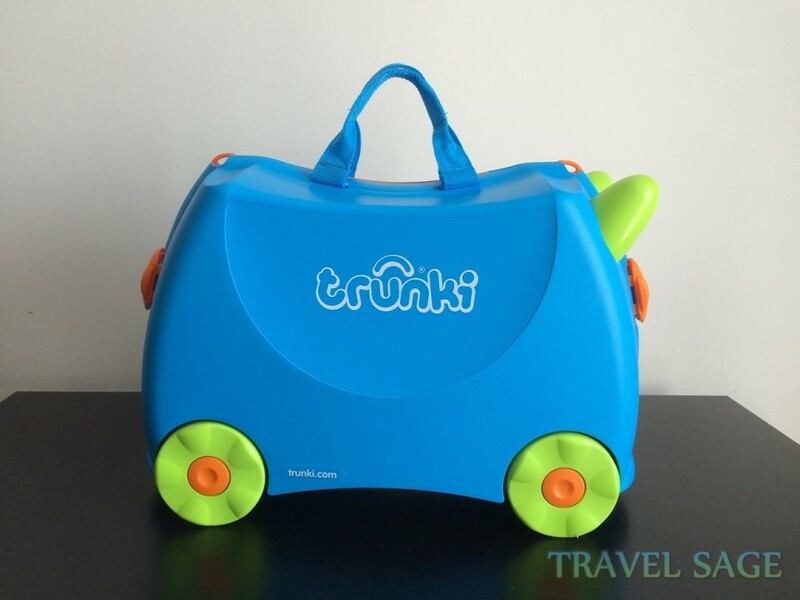 Trunkies measures 46 x 21 x 31cm which is great for holidays as kids’ hand luggage. It’s been approved my many airlines including Ryanair, Easyjet and Flybe. 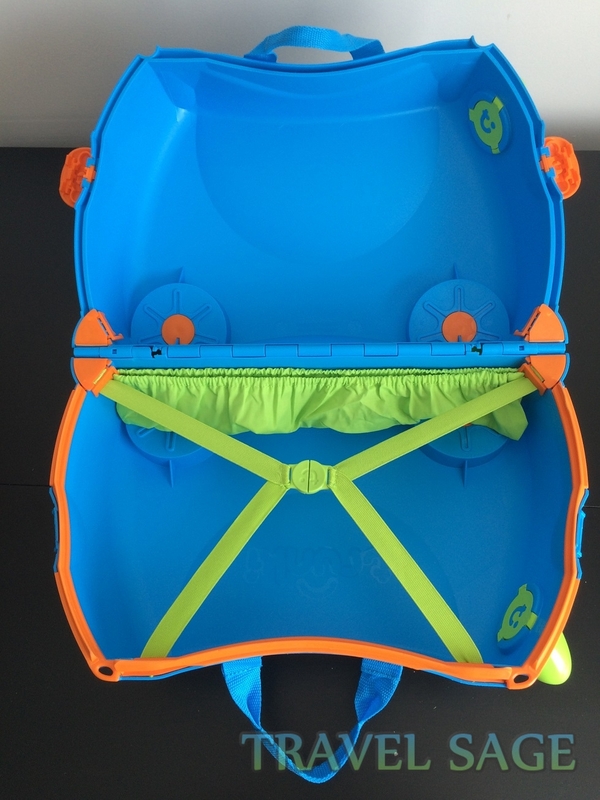 Inside the Trunki Ride-On suitcase, there are 2 compartments which are exactly the same size. Both compartments are very spacious due to there being no fabric lining to take up space like other children’s suitcases. This was more than enough for a 3 night stay and there was still enough room to fit a few more items. One side has elastic belts which hook together in the middle. The manufacturers call these the ‘Teddy Bear Seatbelts’ because the idea is for your child to put his favourite soft toy in and fasten them in. Some kids’ suitcases have this feature as well but theses tend to be on the outside so the soft toy can be easily accessed. However, having their soft toy inside the suitcase will help to keep the soft toy clean and less likely to be lost. 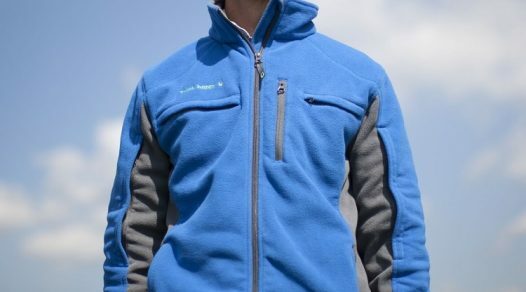 There is one interior compartment which is an elastic pocket. It’s the same length as the Trunki Ride-On suitcase but it’s not deep. A lot of small things can fit in this pocket such as crayons, bouncy balls or lego pieces. 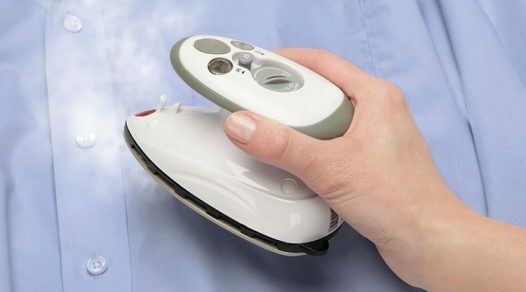 For easy cleaning, this elastic pocket is easily removable. 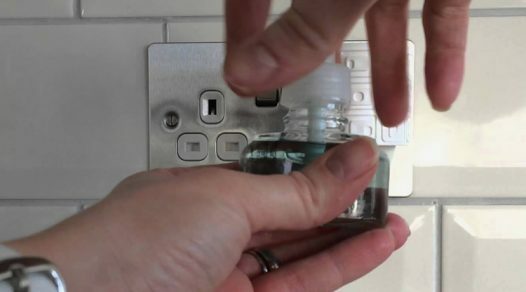 It can be unhooked from the plastic hook when needed and can be hooked back on the hooks in either compartment. 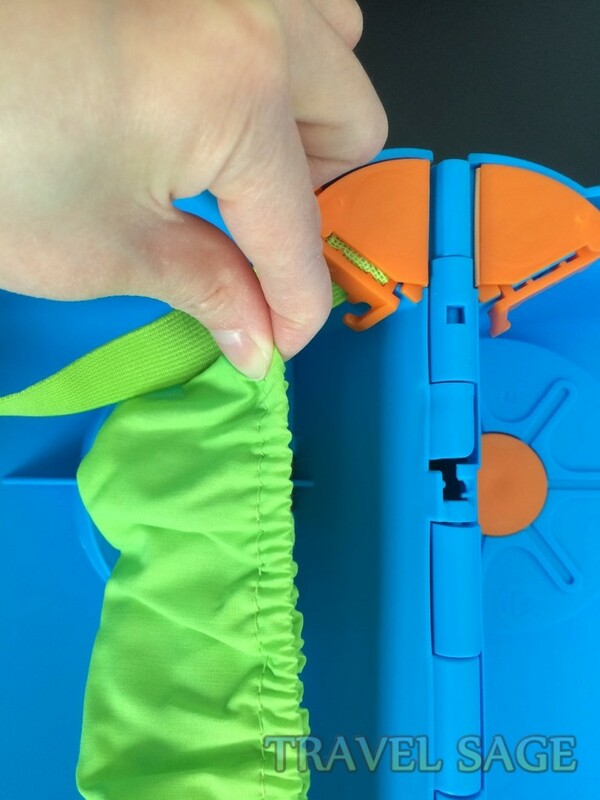 There are 4 secret compartments in the middle of the opened Trunki suitcase. When it’s opened, these compartments are not very obvious. Unfortunately, they are quite small so it can’t fit much inside. My nephew usually uses these compartments to stash his sweets in so it doesn’t melt onto his toys and for easy access. Each one is easy to open as it can be pulled up. However the lids are pretty flimsy so I can imagine the lids will eventually crack after much pulling. This has not been the case for anyone so far. As previously mentioned, the size is perfect for cabin luggage on most airlines. Unfortunately, it’s too big to fit under the seats on planes. Much to my nephew’s distress, Terence Trunk had to go in the overhead locker during our flight to the USA. 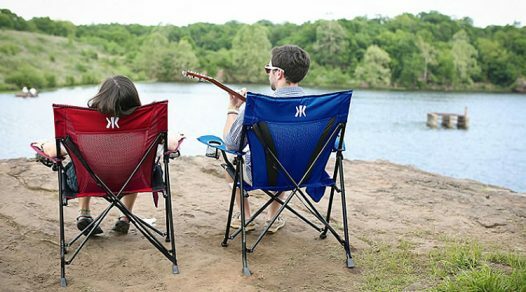 With the light weight as well, it allows kids to pack more of their essential things in. Trunkies are not accepted on all airlines either so it’s important to check your hand luggage allowance beforehand. It’s approved on most short haul airlines but not the long haul airlines. Taking the suitcase on Virgin Atlantic was fine but not on British Airways. When we were queuing to check in at the airport, my 2 year old nephew grew tired of standing and usually he would be crying to be carried or running off to find a seat. Instead he sat on his Trunki Ride-On suitcase and we just pulled him along. With the saddle seat, your child will always have a seat. Parents won’t have to worry as much because their child will always be by them in those long airport queues. 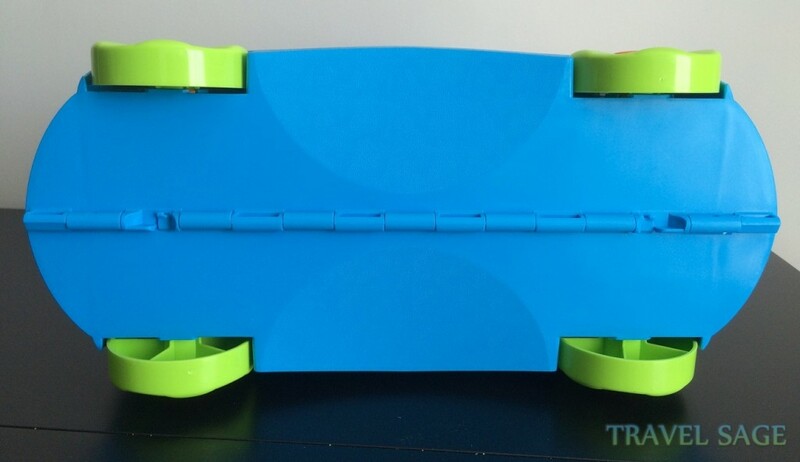 Because the luggage strap is adjustable, it can be easily adjusted to a longer length for you to tow the Trunki case. The shorter length allows your child to tow it which my 2 year old nephew prefers to do because he can run around with it. When no-one wants to pull the suitcase along, it can be clipped onto your suitcase instead. It’s useful as you will still have one hand free to hold your child’s hand in a crowded airport which helps to make travelling less stressful. Having the ID tag has been handy as it helps to prevent confusion over whose Trunkies belong to whom. This has been the case when both my nephews are together on train journeys with the same Trunki. It’s easier to check the tag instead of having to open the case which isn’t ideal on a crowded train. Having the option to carry the suitcase with the luggage strap is useful because it means you can have this on your shoulder like a bag. Due to the hardness and size of the case, it is quite awkward to carry though. 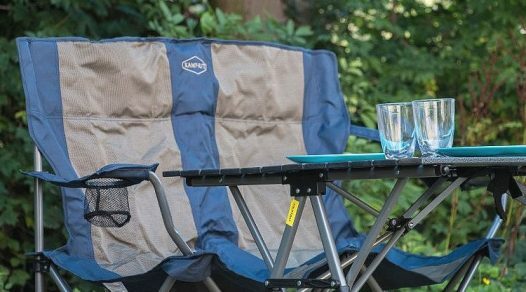 For the first 10 minutes you might not mind but after a while, the strap starts to dig into your shoulder and the hardness of the Trunki case continues to bang uncomfortably against your side. 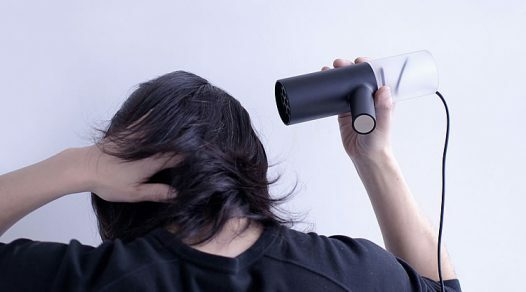 It wouldn’t be so bad if the shoulder strap had a sliding comfort pad with grips on it to stop it from constantly sliding off. With the carry handles, you can easily grab the suitcase when you’re in a rush. Although the carry handles are quite long so there’s enough gap for large hands to fit through, it’s still not very comfortable. The handles are quite thin and due to the coarse material, it leaves red marks on your hands. Not ideal for kids to carry. Again, having padding would be a lot better. As I mentioned before, my 2 year old nephew likes towing the Trunki suitcase around. I say tow but most of the time, it’s dragged around because the suitcase usually ends up on its side because of my nephew’s wild running about with it. However, this has proven that the suitcase is very sturdy and can withstand rough play with kids. 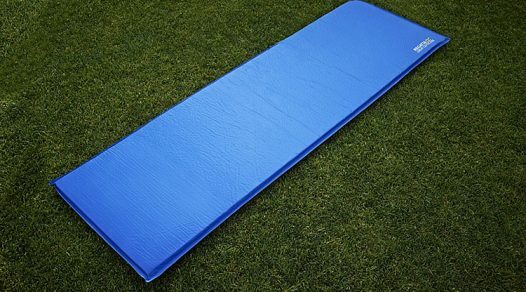 With the hard plastic shell, it helps to protect your child’s toys from damage. Terence Trunk did end up needing a bit of a clean each time though! The wheels spin easily enough even when the suitcase is fully loaded and with a child sitting on it. 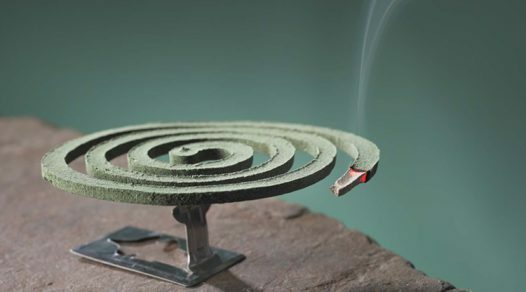 However, they do not spin 360 degrees. This is not ideal when your child is trying to ‘drive’ round corners or when you are pulling them round corners. Attempting to do so will end up with the Trunki case toppling over. So your child has to stand up to readjust the suitcase in the direction they want to go. It’s not great when you’re rushing to catch the plane. The lockable catches are fairly easy to open because it opens with a push on the side button. However, it can be a bit difficult to open as you have to push hard so it’s even harder for kids. Because of this, the catch loosens over time and the Trunki case doesn’t shut properly. There is a 5 year guarantee for all Trunkies though so this may be covered. With the lock, it’s simple to use with the key. Having the key attached to the luggage strap is great because it means your child won’t end up losing it. The downside to this is that the lock and key are all the same which means that another Trunki key will unlock your child’s one too. If you do end up losing the key, you can actually open it quite easily with a coin. This isn’t ideal if you need to take the Trunki abroad as checked in luggage instead. During those long waiting times at airports, the suitcase becomes more than just hand luggage for kids and a seat for children. It’s also a toy so it helps to keep kids entertained. Being a toy, this means kids don’t have to wait until going on holiday to use it. My 3 year old nephew has many uses for his one. He packs his favourite toys and drawing books in when he comes round to mine and he uses it as a seat on train journeys when there are no seats available. 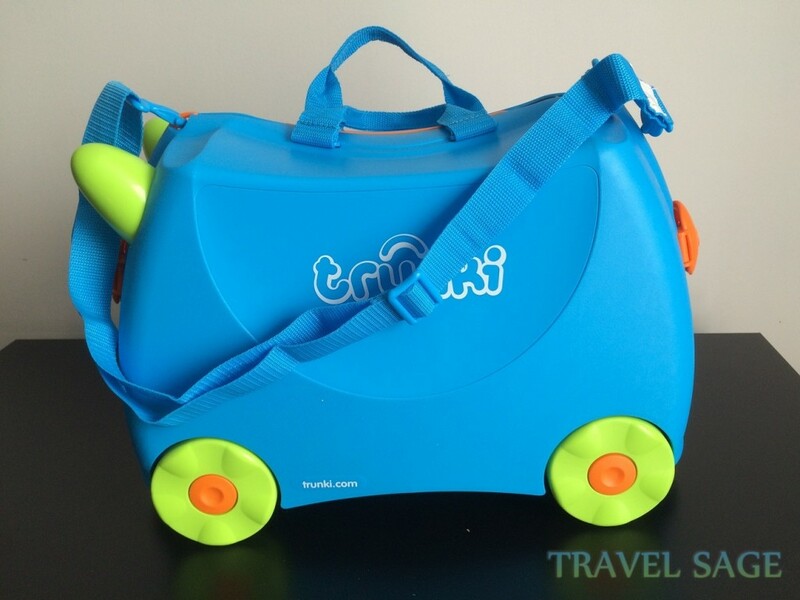 If you have a toddler and planning to go on holiday, it’s worth getting a Trunki suitcase because it will make travelling a lot less stressful. 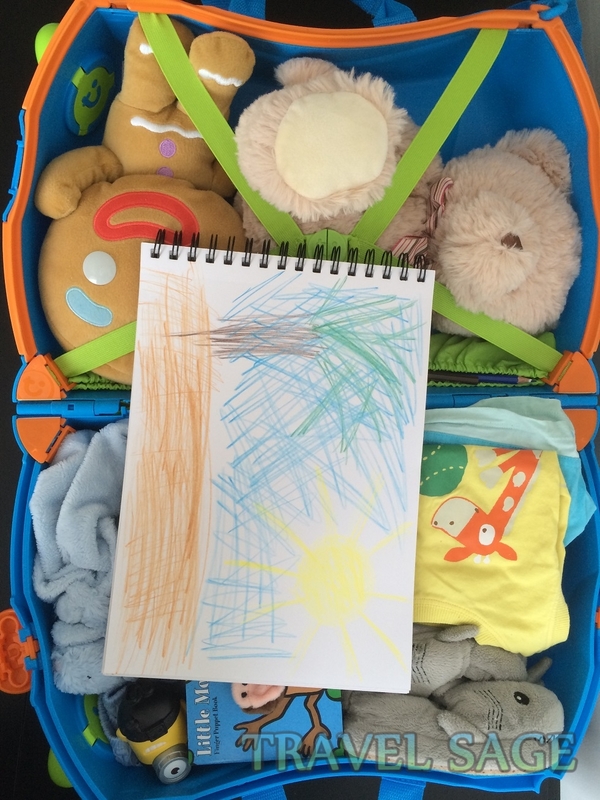 Many families have said this suitcase is a lifesaver because it has made air travel easier (and lighter) with this piece of kids’ hand luggage. 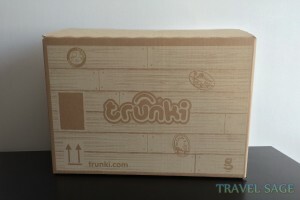 The best thing about it is that Trunki Ride-On suitcases are more than just kids suitcases. When it’s not being used as kids’ luggage for holidays, it can be used as a toy box, a seat, a table or as a toy. So it’s continually used even after holidays instead of having to put it away to gather dust like other suitcases for kids. For the price it’s going at, it’s a little pricey for children’s suitcases but it has been proven by my nephews that Trunkies can withstand a lot of play from kids. Because your child will get a lot of use out of it as well, the money is well spent. 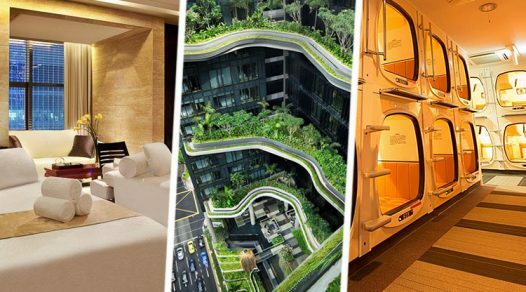 Different Types of Hotels, Where to Stay?